Owning commercial property is a huge responsibility. What building owners do not always realize is that property management companies can take a huge burden of responsibility off of their shoulders. A property management company can be a great asset to you, your real estate investment, and your business; these professionals can completely manage your property, prospects, and tenants. They can also save you time, money, and hassle. Since you’ve landed on this page, you’re likely at least tossing around the idea of a hiring a property manager. Below you’ll gain a better understanding of what property managers do, determine whether you need one, and learn vetting tips. What do property management companies do, specifically? Ensure that your property remains rented at all times; this can be accomplished by providing advertising, interviewing/screening, and placement of tenants. Set and adjust the correct rental rates based on property value; they stay on top of the current value of the property and negotiate with prospective renters. Manage your current tenants; whether it’s maintenance, finances, or legal issues, your property manager will take care of your tenants. Identify and advise you on the ideal prospective tenants; property managers will manage the interviewing process and handle all paperwork. Collect and deposit the rent; your property management team can set the due date for rent payments, collect the checks, and deposit them into the appropriate accounts. Handle compliance issues; housing regulations, tax regulations, and insurance are just a few compliance matter that a property management company can handle. Is your rental property located near your residence? Does your schedule allow you to handle issues that require immediate attention? Are you willing to take care of the day-to-day management tasks yourself? Do you understand the regulations concerning all types of housing programs? If you’ve answered “no” to any of the above questions, you may want to consider one of the many property management companies in your area. When your time is limited and you are not nearby to handle every issue that arises, you’ll have peace of mind knowing that your team will be there. You want to make the most of your investment without becoming inundated with the micromanagement of your property. Owning commercial property generally means that you will eventually require a trusted property management company. There are a number of companies willing to help you manage your property, but how many of them are worth the expense and effort? How many companies can actually do everything necessary so that you don’t have to worry that your property is not being run properly? The good news is that proper vetting can help you lower this risk so that you can get the most out of your commercial property. First and foremost, make sure that the company you’re considering hiring has a good reputation for property management. Many companies and independent contractors claim to be able to handle any type of property, be it a suite of offices or an industrial park, but the proof is in their reputation. Can their references substantiate their claims? Can you find other people who have worked with them? This approach excludes many startup companies, but you have be concerned about your investment first, and experience is key. The individual or team of property managers that you end up hiring will represent you and your company/brand. Therefore, it’s important that you meet your candidates in person to make sure they have a neat appearance and are well-spoken. Do they have experience with your type of property? Look at the type of properties in which the property management companies are comfortable handling. There is a big difference between managing a strip mall and managing a manufacturing plant. You need to find the right people or company who are familiar with your property and the tenants in your type of property. This is a specialist game, and professionals who don’t recognize the differences between the many types of properties — and the unique challenges each holds — will not be able to do an effective job of managing yours. What are the specific property management services they offer? Understand what type of services the property managers you’re vetting offers. There is more to it than simply collecting rent checks, in the field of property management. Many property management companies actively seek out tenants, arrange showings, and handle evictions. Typically, a property manager will oversee maintenance, too. They can even take care of most of the paperwork for you, and so much more. A property manager can involve you as much or as little as you’d prefer. A good property manager knows when to bring something to your attention, and when to simply take care of the matter themselves. At the very least, make sure that your property manager’s services include sales and showing. Even if you have a suite of offices that are full, a tenant may choose to move and then you’re on the hook to find a new tenant. However, property management companies can take care of that for you. Many will advertise the space and be available to show it to potential renters. They can handle maintenance of the unit while it’s not under anyone else’s care and keep it in good shape so it’s more attractive to those who might be interested. Do the property management companies have a thorough understanding of your local area? When vetting property management companies, it’s important that they have an understanding of your local area. Knowing the ins and outs of your area will help them prepare. Is this a location where graffiti is common, requiring regular clean up? Does the parking make it difficult for renters to access their units? What kind of solutions can be worked out? These are all important factors that your property management company should be aware of. Can the property management company handle the financial aspects of your investment? Find out whether the property management company has the corporate infrastructure to handle the financial aspects of management. Usually, property managers are required to handle the collection of rent, the purchase of incidental or common expenditures, and any emergency payments that may crop up. In that case, they need to be able to thoroughly document everything and inform you of the decisions they make. Similarly, you have to trust that they will make financial choices that you can both accept and agree with. An investment property should make you a profit without your need to constantly work on it. That’s why it’s so important that you find a team who will manage the day-to-day tasks without adding more to your plate. 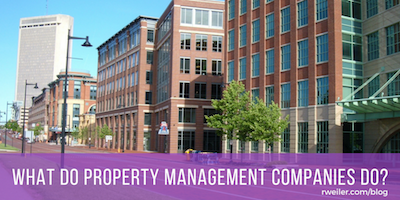 Looking for a property management company in Columbus, Ohio or throughout Central Ohio? In Columbus, property management companies may make many promises, but none can anticipate your needs quite like The Robert Weiler Company. Since 1938, our experienced professionals have been providing top-notch commercial real estate services – from appraisal and brokerage to property management services and more. In addition to servicing Columbus, Ohio, we also manage properties throughout Central Ohio. No property is too large, and no need is too great. Whether you need legal assistance, help with tenant management, or building management, we are your go-to team. One of the most important goals of an investment property is to maximize your income while keeping costs down. We can provide detailed reports to help you determine where updates and changes need to be made. We can also help market your property, attract potential tenants, then qualify them with credit checks and references. Hiring The Robert Weiler Company to manage and maintain your property will help you receive the highest rent possible while reducing your expenses. We maintain a high level of integrity, credibility, and unsurpassed local market knowledge. As a full-service commercial real estate and appraisal firm, we believe in building relationships, not just completing transactions. You will have a close relationship with your property manager, whom you can count on to get the job done correctly, efficiently, and effectively. Your property manager can easily be reached for status reports, to answer your questions, and address any concerns. As one of the most sought-after property management companies Columbus, Ohio offers, there’s only one choice as to who should manage your property: The Robert Weiler Company. Still asking yourself, “What do property management companies do?” Want to know how we can help your specific needs? Call 614-221-4286 to speak with one of our property management advisors today.